Discussions of the most exciting, most expensive or the ‘Best’ neighborhoods in Oahu real estate will inevitably turn to the current mainstays like Kakaako, Kahala or Ko Olina. For those who know the Island intimately, though, those marquee names are just the start, not the entirety, of that conversation. The fact is that there are communities across Oahu that possess something wonderfully special, something stunning, that has escaped notice somehow. Neighborhoods that you probably never even heard of before. Come learn what makes them stunning to even longtime Oahu real estate followers and you’ll never forget them again. Waialae Golf Club is well known as probably the most elite of its kind in all of Hawaii. Only one neighborhood lies not only along its fabled fairways but also on the Pacific itself, and that is Kai Nani. Created in the 1960’s from lands the Bishop Estate took back from the golf club, these lots immediately took their place at the top of the Honolulu homes scale. Every one of the only 30 properties in this community holds a luxurious house of the size and extravagance that only the most wealthy can attain. The views of the ocean from this most envied of Oahu’s coastline is elevated by the beach here that seldom sees outsiders due to its isolation. There may be no private beaches in Hawaii, but this is pretty close. This is the mirror image of beachfront Kahala that bookends the other side of the golf course, but with added advantages. Same incredible views and scenery. Zero through traffic. It’s what Kahala Avenue residents can only wish they had. 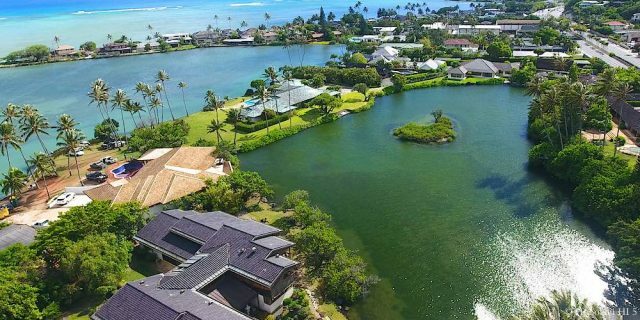 There’s more here than just a lagoon, though that alone would make these exceptional Oahu homes. Paiko Lagoon actually has 3 bodies of water in it, beginning with Kanewai Fishpond, created by Native Hawaiians over 1000 years ago. That connects to the titular lagoon, part of which is a protected wildlife sanctuary, and, in turn, it flows out to the open ocean. While the pleasures of living in sight or even beside any of this trio would be enough, some homes have the privilege of dwelling on the strip of land between the pond and lagoon. Even better are the few prized lots on the terrain that is the makai side of the lagoon on one hand and oceanfront property on the other. It is truly a Win-Win situation for those residents. The formally recognized historic status of the fishpond and lagoon’s established sanctuary sets in stone that these waters will remain unsullied, a promise that other parts of Honolulu cannot always claim. In Paiko Lagoon, however, you can have what they call a Forever View. Locals often refer to, and even think of, the entire neighborhood on Koko Head’s makai side of Kalanianaole Hwy as Portlock. If you continue on that volcanic outcropping toward the Pacific, though, when you get to the end, you’ll be in a place all its own, called Koko Kai. Even from the road it isn’t difficult to understand the attraction of living here. Almost every house has an ocean view, one uncluttered by the sights, or noise, of the highway or development. It only goes up from there for those whose residences sit right on the water, the waves crashing just off the small cliff they sit on above them. That private contentment is accentuated by the lots that leave room for the large luxury homes as well as yard space you can spread out on. There’s much you can do with an area that has at least 11K sq ft and, in most cases, a lot more. Nature’s power and grandeur surrounds this place, with prime surfing spots just off this coastline, the famous Spitting Cave a short walk from these residences and sunsets descending over the Pacific each evening that cannot be missed. Koko Kai may be lower profile, but the residents seem to have no problem with that. 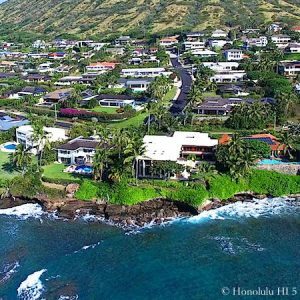 If you had to guess, what would be the most prized real estate in Kailua? If you believe it’s the strip of land along the coastline, you’d be right. Amazingly, almost every piece of that treasured property falls under just one neighborhood – Beachside. As the name indicates, sands lie along the entire stretch of this community, from the north side of Kailua Beach Park to where it ends at the meeting of Kawainui Canal and Kailua Bay. 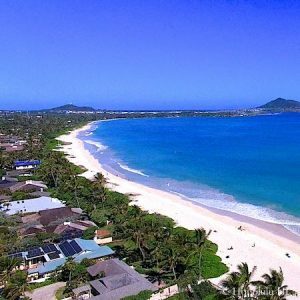 Living here places you above the crowds of tourists and locals who flock to Kailua Beach, the miles of Beachside’s shoreline safely outside the growing activity down there. Residents instead have a slice of Old Kailua, when the sands were quieter and provided a more soothing retreat. The houses themselves are a very broad collection of sizes, styles and ages. Small, vintage beach bungalows still sit on some of these lots, measuring under 1,000 sq ft of interior, but resting on property 10 times that size. Again, Old Kailua still survives here. You’ll also find those huge luxury mansions that fit our modern conceptions of what you’d expect to find on oceanfront real estate of this caliber. As President Obama’s vacation spot of choice, it becomes clear that these are more than just picturesque properties. They’re often nothing short of astounding. 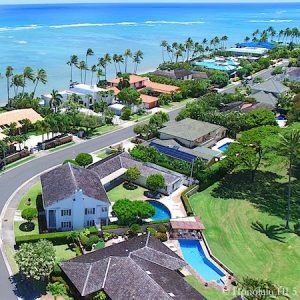 Lilipuna tends to be hidden under the radar of Oahu real estate shoppers. It doesn’t have the cachet of neighborhoods in Kailua or Kahala. That can present an opportunity because its oceanfront homes have views that easily stand with that of much more expensive zip codes – and at a better price point. 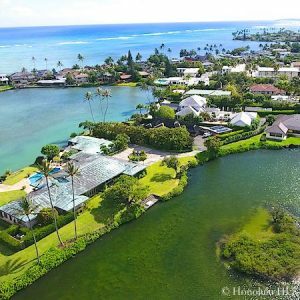 One that sat right on Kaneohe Bay here sold for under $1M in late 2016, which had been remodeled that same year and an 11K sq ft lot. The underrated beauty of the bay benefits many of the houses that are further back as well, the natural slope of this area creating sight lines out on the Pacific that you’d never have in flatter Kailua. Many of those views include Coconut Island, which adds a distinctly South Seas touch that is truly romantic. In Lilipuna it is still possible to have a sweeping ocean vista of awe-inspiring beauty, without paying a King’s Ransom to get it. The neighborhood of Mahinui is, in some ways, a transition between Kailua and Kaneohe, retaining elements of both. With some small exceptions, it takes up most of the southern half of the lands right along Kaneohe Bay, specifically those on the makai side of Kaneohe Bay Drive. 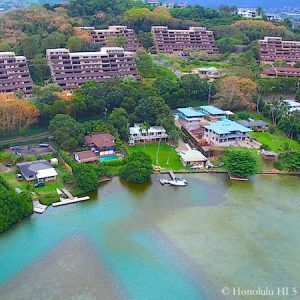 That includes the residences around Kaneohe Yacht Club, as well as a section that extends up into the hills once you get around the bottom of the bay’s curve. 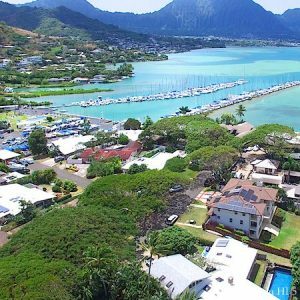 Mahinui is the quieter, more upscale section of Kaneohe, with little development, no large shopping centers or busy arteries and featuring some very luxurious homes. Residents of these properties have the waters of the bay before them, from the oceanfront mansions to much of their neighbors behind who sit on higher ground as the land ascends away from the coast. It’s a place that confounds the stereotypes of Kaneohe, holding on to the once familiar Windward ways that are becoming more difficult to find. Say that one word ‘Waimea’ and many will immediately recognize it as one of the preeminent surfing spots in Hawaii, and therefore the world. It’s a magnetic spot on Oahu’s North Shore where people gather on one of the biggest beaches along this coast and marvel at the power and size of the waves. Now imagine living next door to that. Most will have be content with imagining. There’s just 15 lots make up this very exclusive community on the very end of the land that makes up Waimea Bay’s east rim. Almost ½ of them line the shore with limitless ocean that provides the backdrop to your days here. 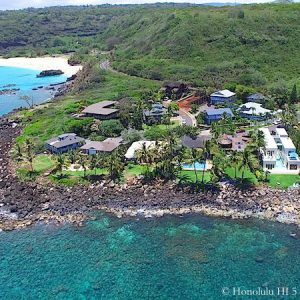 The houses are all luxurious, but not excessive, topping out at a little over 6,000 sq ft interiors and total property dimensions of, at most, 9,000 sq ft. It’s not about having the most sprawling home that draws so many to Waimea Bay anyway. It’s spending your life at a place so astonishing, it’s become a pilgrimage for even the most jaded of locals. Kawela Bay is about as North Shore as you can get, its location being just west of the northernmost point of Oahu. For those who want to escape the escalating development of the Island as much as possible, without leaving its shores, this is where you should go. Residents here complain that Haleiwa is too developed. Even for the decidedly rural and spread out nature of this coastline, you’re off on your own. It’s a mile to your closest neighbor eastward around Sunset and a mile and a half east to your western counterpart, Turtle Bay Resort. The residences of this small neighborhood are all gathered together on the east side of the bay itself, the fortunate survivors of previous efforts to build a resort on this section of the coastline. Those developers may have not succeeded, but they obviously knew prime real estate when they saw it. The main section is a gated community of luxury homes built since the Millennium, with at least 3K sq ft interiors and often large lots. The oceanfront houses have a view of the famous North Shore swells and natural surroundings that feels very close to what Hawaii must have been like Pre-Contact. Outside the gates, along the highway to the west are older and smaller residences that lack the high-end comforts, but have an enduring, time-honored charm. They also sit on the oceanfront, indulging in the great pleasures of this environment that no amount of money can match. None of these neighborhoods is what you’d call a household word on our Island. Despite having so much to trumpet, precious little has heard about them. For a majority of their residents, that’s probably just fine with them. These communities thrive on an intimacy and a protectiveness of what has made them so special, content to have less attention in exchange for a little peace and a greater quality of life.